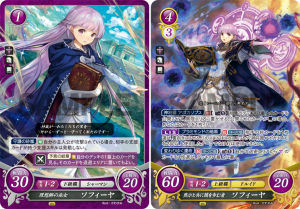 Fire Emblem Cipher Series 16 Release! 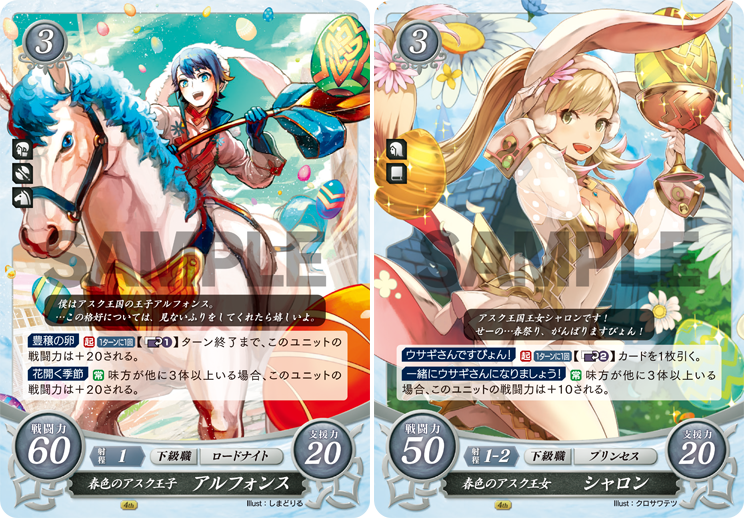 Last month on 22 March, Fire Emblem Cipher Series 16 came out in Japan! Scroll on down below for a closer look at the cards and promotional items available in the set. NOTE: Some of the artwork and cards contained in this set do contain spoilers for their respective games. Proceed with caution if you’ve not yet finished playing these titles. 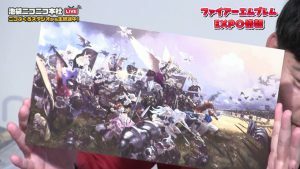 Fates Artbook Cover, Three Houses Cipher Promos & Meet Edelgard! 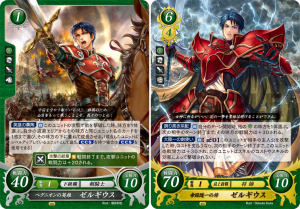 Earlier today, Fire Emblem Cipher held its Series 16 pre-release livestream. 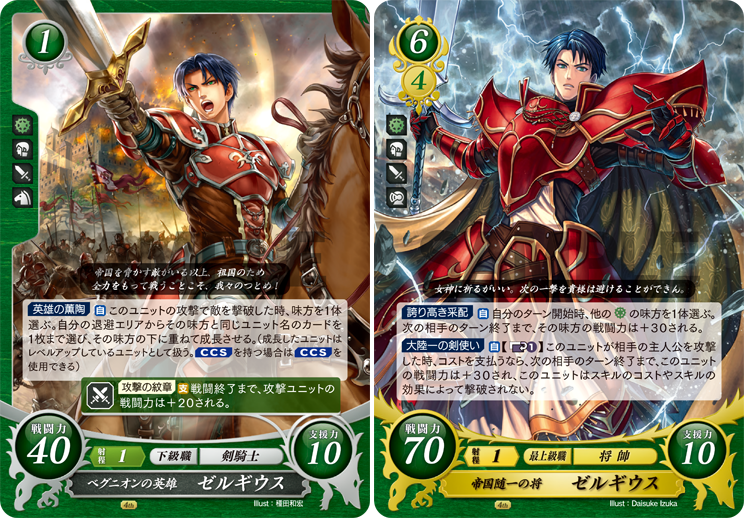 In addition to many Cipher-related news and reveals, the team shared some more general Fire Emblem info as well. As promised, the cover artwork for the Fates artbook “Pellucid Crystal” was unveiled during the livestream. Yusuke Kozaki has really outdone himself with a highly detailed panorama featuring Nohrians and Hoshidans fighting together. The artbook can be pre-ordered via Amazon Japan. The editing team has also opened up a webpage showcasing various sample pages from the artbook (which you can also find below). As a reminder, the book contains 320 pages and releases on 25th April 2019. Next, the hosts showed off a trio of Cipher promotional cards depicting the House Leaders from Three Houses. These will be given out during this year’s “Cipher Festival” event. The artists are Kotaro Yamada, Senri Kita and Rika Suzuki. Besides the spiffy art and brown/olive border colour, no further details were provided. 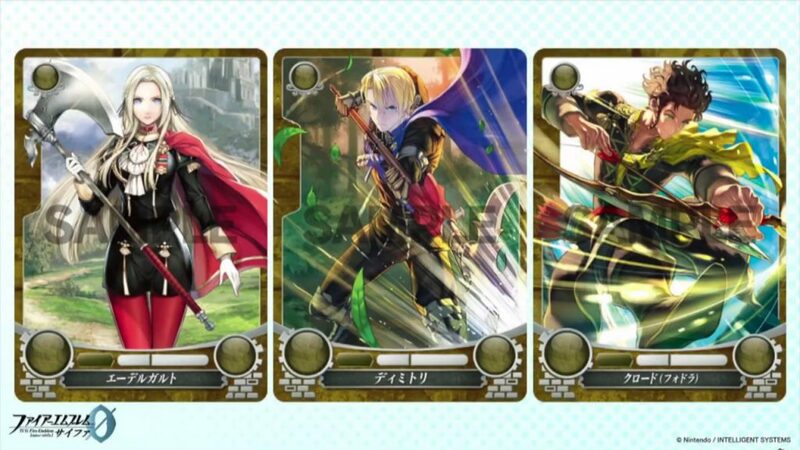 That said, we do know Three Houses will feature in Cipher‘s Series 18, although it’s likely these cards will precede that series. Nintendo Japan has shared some new details about Fire Emblem Three Houses‘s Japanese special edition, the “Fódlan Collection”. Firstly, here’s a look at the game’s box art and main visual. The cover illustration is designed by Miss Chinatsu Kurahana, who’s the character designer for this game. In the background is the Garreg Mach Monastery, the two protagonists standing solemnly with their swords, and the three house leaders each crossing weapons. 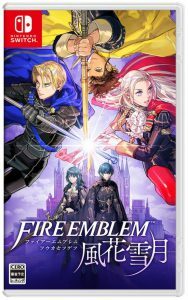 The standard edition will have the same cover. Next is the Fódlan Artbook, which includes character designs and landscapes. 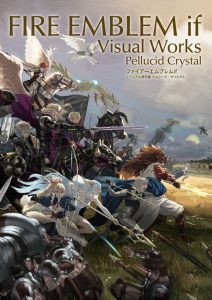 This is an art book containing 128 pages in total with a large number of illustrations and concept artwork. These include details of all the students enrolled in the three houses. If you read this, your enjoyment of the game’s world will surely be enhanced! 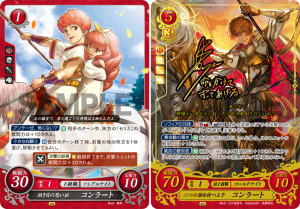 Cipher S16 Weekly Recap: Card Reveals, Promo Goodie Images, & Livestream Details! 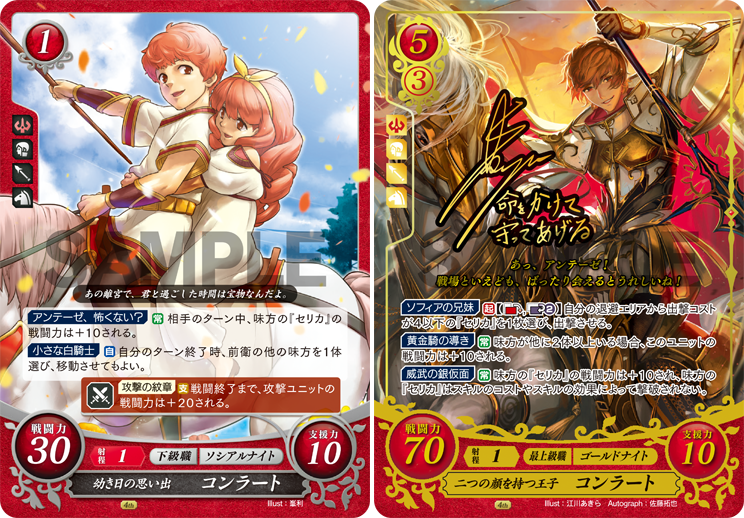 It’s been another fun week of card reveals for Fire Emblem Cipher! With Series 16 covering so many titles, @fecipher spread the card colours pretty evenly this week. Still, Binding Blade pulled ahead with two big profile reveals: Fae & Sophia! 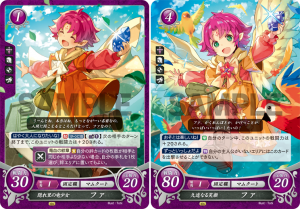 Fae gets two cards to herself, a Cost 1 and a shiny R foil. Sophia’s cards on the other hand are a bit more interesting. In her SR on the right she’s wielding the legendary tome Apocalypse, placing her in the large joined-art of the set. 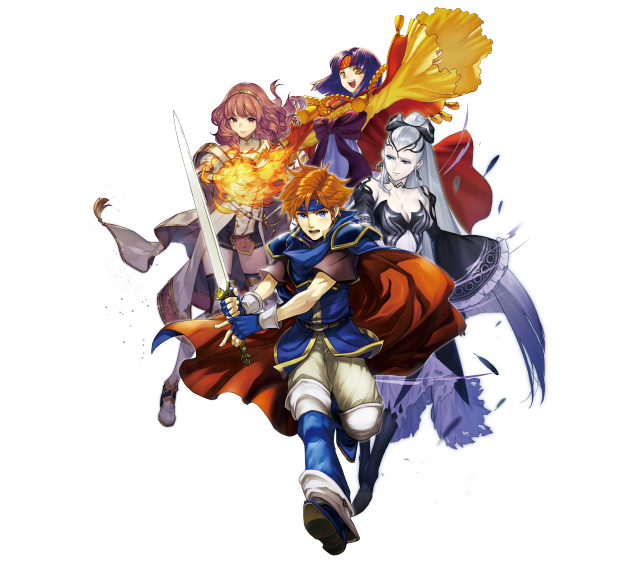 With Roy in the centre with the Binding Blade and Dieck wielding Armads, we have only six characters to go. 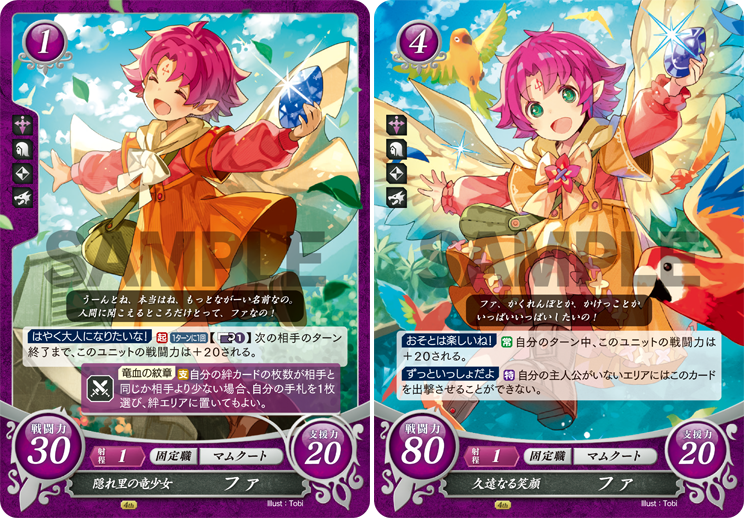 Two of the other reveals of the week, like Fae, show off Cost 1 N cards paired with an R foil. Zelgius comes as the green Tellius representative for the week, and Conrad as the red Echoes representative. Furthermore, Conrad’s foil shown here is actually a special R+ version, signed by his Japanese VA, Takuya Satou! 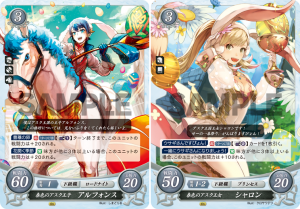 The final card reveals of the week feature Heroes representatives: Alfonse and Sharena! Both cards take inspiration from their special Spring versions in game. This is notable as seasonal Heroes characters have traditionally been promos, not set cards. 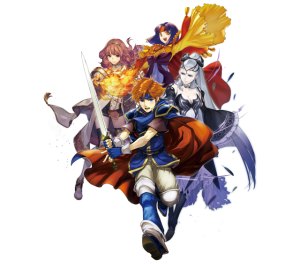 Perhaps we’ll see some more seasonal characters with the remaining FEH cards? In addition to the twitter reveals, we also got some more official site updates recently. Although there’s nothing particularly new or noteworthy in these updates, they do provide some nicer, high quality images of set related promotional goodies.